Science-fiction writer K.W. Jeter coined the term in the late 1980s, and the movement identifies with the fiction of H.G. Wells and Jules Verne. The style typically embodies technology-driven sci-fi motifs, Victorian-era “Great Explorer” adventurousness, and the Industrial Revolution’s practical, polished precision. 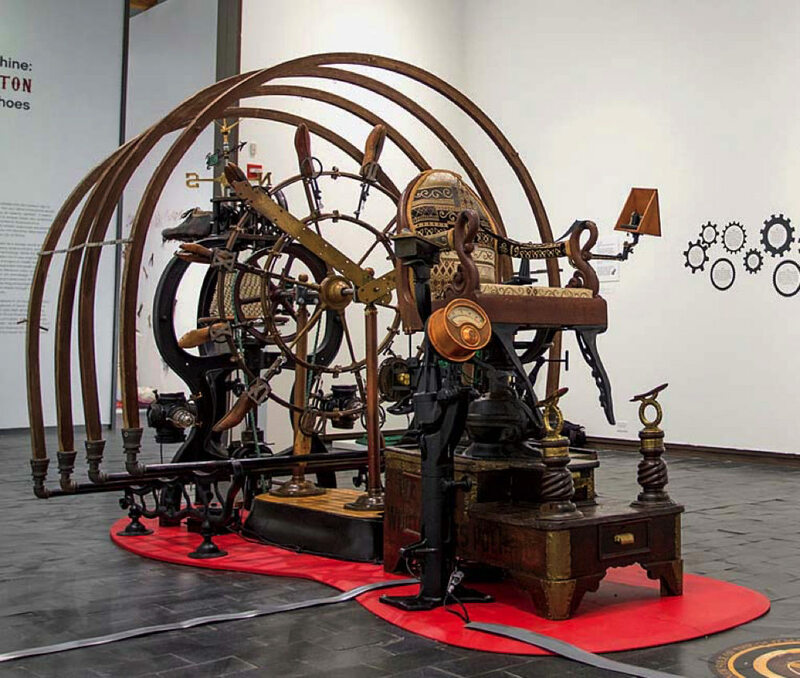 At the Fuller, regional artists made “Steampunk” works reflecting Brockton’s foundation in footwear. By the turn of the twentieth century, Brockton’s more than 90 factories employed thousands and shod citizens nationwide. 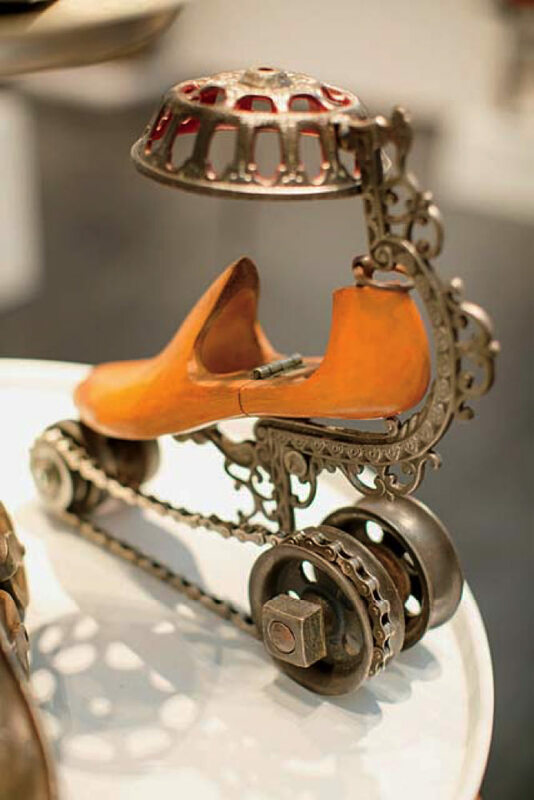 For the whimsical Shoe Carousel, found-objects sculptor Michael Ulman repurposed elegant metal and wooden shoe forms. 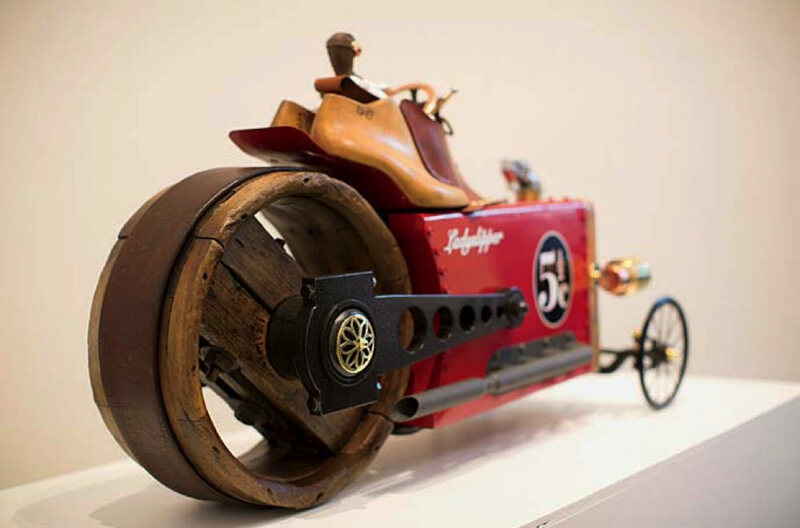 John Belli’s toy-like Ladyslipper: Land Speed Racer (named for a shoe-industry magnate’s car), incorporates a wooden pulley and drive-belt from a local manufacturer and a cockpit that mimics “a heavy boot upper.” Artist Jim Bremer’s mother worked in a shoe factory, inspiring him to honor the quality craftsmanship and “creativity, hard work, and team work” that built New England’s manufacturing hives. (For The Sky’s the Limit, Bremer and his wife, Ruth Buffington, hand-sewed hundreds of beads, buttons, watch gears, and pins onto the image of an airship.) 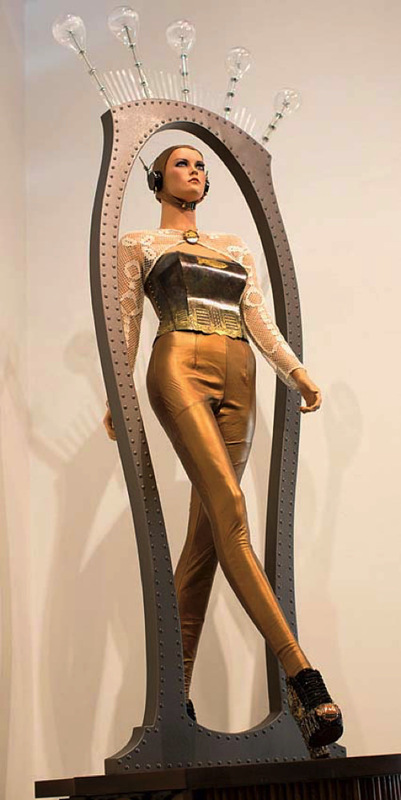 In their One Giant Step for Brockton, a statuesque mannequin sports gold leggings, platform shoes, and an antenna-topped aviator cap as she strides through a riveted doorframe: a benign Metropolis warrior princess, of the sort who might someday recharge a city, like Brockton.